Lower Sussex’s Katie McHale slides into home plate for a score against Maine on Tuesday, July 24. Olivia Hitchens goes for a bunt in LSLL’s 4-2 win over Maine. Camryn Ehlers sends the softball to home plate. 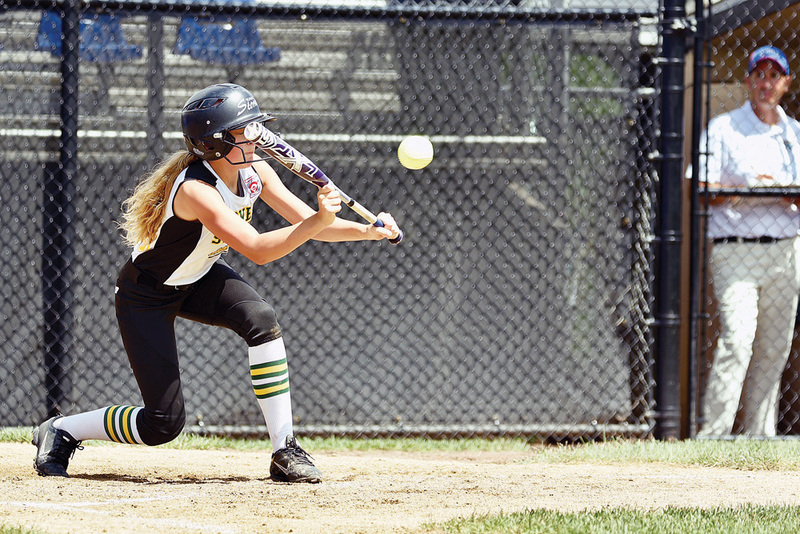 The Lower Sussex Little League Major League softball team was 3-1 in the Eastern Regionals as of Coastal Point press time on Wednesday, July 25, with weather having the four remaining teams in a holding pattern as tournament officials decided the fate of the participants. 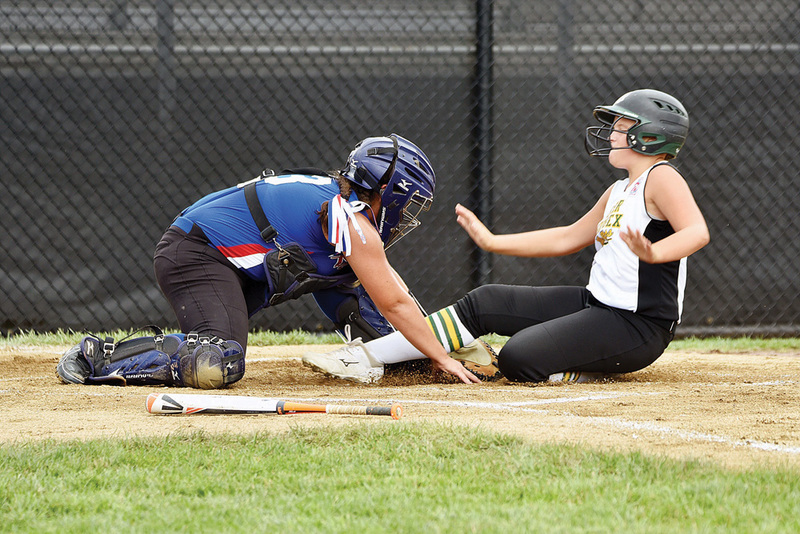 According to Lower Sussex Little League manager Sarah Hoban, no official word on the tournament’s completion had come down from the Little League directors early Wednesday afternoon. However, just before Coastal Point’s press time, Little League officials announced that the teams would continue play on Thursday afternoon — weather permitting. With that decision made, Pennsylvania was set to battle Rhode Island on Thursday, July 26, at 1 p.m., with LSLL facing Connecticut at 4 p.m. on Thursday. The loser of the PA-RI game is to play the winner of LSLL-Connecticut on Friday, July 27, at 9 a.m., with that game’s winner then playing in the championship against the winner from the Pennsylvania-Rhode Island game from Thursday. While the tournament is set up in a double-elimination format, play had been hampered by weather, and with Pennsylvania and Rhode Island the only undefeated teams left in the regionals as of Wednesday, it was possible that just those two teams would stay to play a winner-take-all regional championship game once the weather cleared, according to Little League officials. It would have been a disappointing end to a magical run for LSLL and their opponent Connecticut, with both, in that circumstance, not getting a chance to fulfill their World Series goals, having each suffered a loss earlier in the tournament. In their first game of the tournament last Saturday, July 21, LSLL blanked Maryland, 7-0. Camryn Ehlers and Kinsley Hall combined for the shutout, with Ehlers firing five innings of one-hit ball with nine strikeouts. Hall pitched a spotless inning in relief. LSLL secured the victory over Maryland thanks to four runs in the fifth inning — with Lily Hoban, Ehlers and Shaniya Lewis all contributing with RBIs. LSLL finished with seven hits in the game, with Laniya Lewis, Shaniya Lewis and Jaya Shaub all having two-hit efforts. Ehlers had the other hit, with a pair of RBIs. Laniya Lewis also had two RBIs for the winners from Delaware. In their second game against New York, LSLL was again impressive, with a 6-0 decision. Ehlers was once again firing on all cylinders, allowing just five hits with six strikeouts over the complete-game effort. LSLL tallied three runs in the fifth inning to put the game away after scoring three runs in the third inning to break up a scoreless tie. Laniya Lewis and Shaub both contributed in the fifth inning with RBIs. The LSLL team racked up 10 hits in the game, with Laniya Lewis, Lily Hoban and Hall all having multiple-hit efforts. Laniya Lewis finished with three hits in her three at-bats, while Shaub finished with three RBIs in the game. Rhode Island and LSLL then battled through six innings in a well-played softball game in which the Delaware team just came up short, in a 3-2 setback, dropping them into the losers’ bracket of the double-elimination tournament. Ehlers surrendered eight hits over her six innings of work, with five strikeouts, while allowing the three Rhode Island runs. Ehlers led LSLL at the plate, with two hits in three at-bats. Destiny Mitchell, Aniya Blake and Bella Scurci had the other hits. Rhode Island’s Sofia Marella drove in her team’s run in the first inning with a double. But after that solitary loss, LSLL stayed alive with a 4-2 win over Maine on Tuesday evening, July 24, as Kinsley Hall was lights-out in the circle. After some early control issues in the first inning that led to a pair of Maine runs, Hall settled in, tossing a complete game. She would allow four hits while offsetting a pair of walks with seven strikeouts over her 90-pitch effort. LSLL managed just two hits in that game, with Shaub and Katie McHale each picking up singles. However, the Delaware girls utilized five walks, five stolen bases and three wild pitches to score their four runs. Aniya Blake scored the eventual game-winning run after drawing a one-out walk, then advancing all the way to third with two steals. She would score on a wild pitch. Hall added an insurance run when she also walked, stole second, moved up to third on a passed ball, and finally scored on another wild pitch. The win moved LSLL into the final four, with the game against Connecticut yet to come. To find out how it all played out, check out the Coastal Point sports news Facebook page.